Normally, when I travel, my anxiety levels rise, as I’m far away from the restaurants I love and the safety of my own kitchen. While we were out west, however, I didn’t find myself worrying about food. Everywhere we went in Wyoming and Montana, people knew about gluten and were willing to accommodate me if they didn’t already have their gluten-free items listed on the menu. We also didn’t feel limited to only eating at really nice restaurants, as there were plenty of more casual restaurants that had a wide range of options for me. Particularly in Jackson Hole, I don’t even feel like we began to tap into the dining world, but we did get a great sampling of the yummy (and gluten-free) flavors Jackson Hole has to offer. Many GF treats greeted me in the glass case! After enjoying drinks at Spring Creek with my friend Beanie, (and attempting to adjust to the altitude) we returned to Lotus for our first dinner in Jackson. I was immediately overwhelmed by the plethora of options…what a rare treat! One of my favorite menu items was the gluten-free samosas with spiced peas and potatoes. This dish, which is basically a large breaded dumpling, is always a no-no for me. 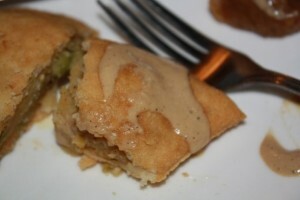 At Lotus, however, they use a combination of brown and white rice flour in their samosa recipe. Delicious! The sauce accompanying the dish is amazing too. For our entrees, David and I decided to share, since I could actually know for sure that his meal was gluten-free too. He ordered the chicken tikka masala (one of our family favorites) and I went with the ‘Fiesta Bowl’ with bison. 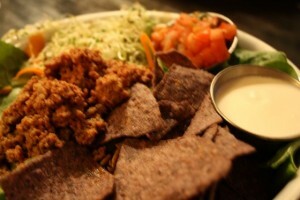 The fiesta bowl consisted of a mix of bison, cheese, lettuce, corn chips, lentils and other yummy goodness. I always like to combine everything on my plate so this dish was perfect for me. 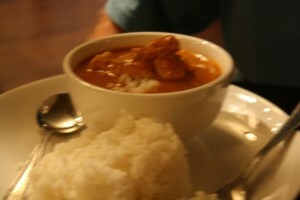 The tikka masala also received positive reviews from both of us and I loved getting to reach across the table and grab a bite off David’s plate and not worry about contamination, gluten, etc. It’s the simple pleasures in life, right? What a meal! 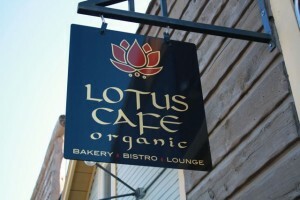 Oh, and the best part is that Lotus also serves breakfast and lunch. 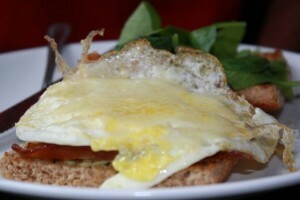 All of their sandwiches can be prepared on their homemade gluten-free bread. The whole time I ate my dinner I was planning when we could return to try their other food! Unfortunately we never got back to Lotus for lunch but we did go for coffee and breakfast a couple of times. 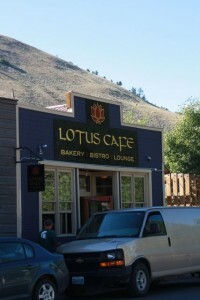 If you’re in Jackson, Lotus is the perfect place to go just for a cup of coffee. We brought our books and would make a morning of it until we got motivated to start moving and hiking. (More about the hiking and reading later.) All of Lotus’ baked goods (cookies, muffins, etc.) are vegan, making them dairy free and egg free. 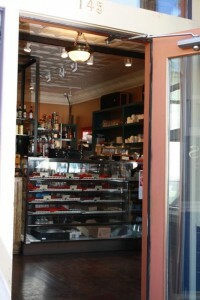 Many of their items are also gluten-free. Fortunately, I didn’t realize the muffins were vegan until after ordering. (Usually I shy away from foods that are missing milk, eggs, and butter!) These muffins were delicious! I have a much more positive attitude towards vegan items now that I’ve sampled these amazing treats. 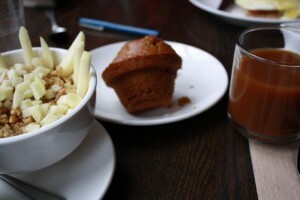 During our time in Jackson, I enjoyed Lotus’ raspberry cashew muffin and zucchini muffin. So good. 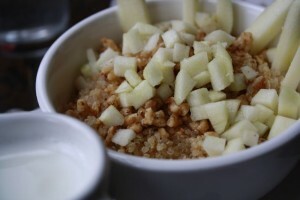 One morning I also ordered the ‘Maya,’ steamed quinoa with apples, cinnamon candied walnuts and organic milk. Sweet quinoa is quite possibly my favorite culinary discovery while out west. I guess I’ll just have to go back to Jackson to sample the rest. When I started this post, I thought I would write about all of the restaurants where we ate in Jackson, but clearly I’ve got a lot to say. The others will just have to wait. Lotus definitely deserves an entire post to itself. Thank you, Lotus Café. I hope to see you again soon. 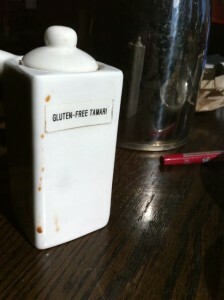 PS: Lotus also has gluten-free tamari/soy sauce on every table. Even labeled! 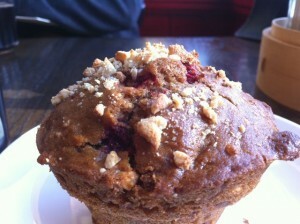 Who doesn’t want a little soy sauce on their raspberry cashew muffin?